_ Look at both sides before you cross the street. But Tommy the chick didn´t obey his mother and while he was crossing he saw a car getting close to him at a fast speed so he had to run scared towards the pavement to avoid being run over. Luckily, he only lost some feathers because of the wind force. _ Tommy, don´t get close to the fire because you will get burnt! But as Tommy the chick was really very rebellious he got much closer and eventually burnt his little leg. Mummy the hen heard Tommy the chick crying in pain and decided to heal the little chick. _ Shall I go to the farm to look for some worms? _ Darling, it´s cloudy and it seems likely that there will be a thunderstorm! – the mother replied. _ It won´t rain – claimed the chick. 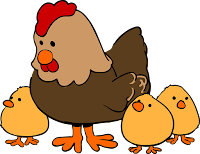 And disobeying one more time, Tommy the chick took a little bag, put it around his neck, and went to the farm. Once he arrived the chick started to catch worms of different sizes with his little beak and put them inside his little bag. But as he was trying to catch another worm that was digging into the soil, he suddenly heard the crack of a thunder and saw a lighting in the sky afterwards. His feathers bristled because a great storm had started. As he knew that the water and the lightening could kill him, he rushed towards a rock and found shelter inside a tiny cave. Inside the cave he cheeped and mourned because he had disobeyed his mother the hen. _ I guess I caught a cold! The hours kept passing by and when it had already gotten light, Tommy the chick woke up with a terrible fever, tired out and with his feathers bristled. _ This is the end of my life. Having said that, the fell back, stretched out his little legs, turned his little head and his little eyes closed shut. In that very moment, mummy the hen came, picked up his little legs by her beak, and returned to the farm. There, she wrapped him up with her feathers and treated him. _ From now on, I will obey my mummy so that everything will go well in my life!